TV Show Boat for Sale to the Public click here! North American Crappie Angler TV can be viewed by online broadcast at The Sportsman Channel, go to their website and register for the online broadcast, make sure to download the new Media Player number 9, they have a link there for you to download it. If you do not download the number 9 version of media player or it will not work right. If you get The Sportsman Channel by TV then tune in at the times shown below, if not and you have internet service then watch the show online at the below times also. Also catch the show on Cox Cable In N E Arkansas every Saturday Morning at 10:00AM CST or Sunday Evenings at 7:30PM CST on Channel 14. 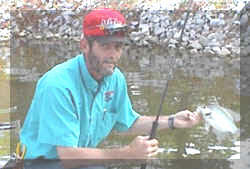 North American Crappie Angler is the source for the 40 million crappie anglers in North America. Please give our Sponsors the first try in the market place when you are in the needs of there products, click here to visit our sponsors. Your Host Scott Jones will take you all over North America for Crappie Fishing action with many tournament professionals as well as everyday crappie anglers showing you there tips and techniques on catching crappies 12 months out of the year. For the first time crappie anglers have a 52 week a year show on crappie fishing, if you do not get The Sportsman Channel click here to see how you can get 24 hours a day seven days a week always hunting and fishing. Don't miss North American Crappie anglerser Television Series each week.